A lesbian was violently attacked in a gas station parking lot for rejecting a man’s advances. Bailey Cantrell said that she was approached by a man at a gas station in Nashville, Tennessee. “My friend had gone into the gas station to get something and I was waiting outside, and this man approached me and was asking for my phone number and was calling me all these names,” she said. “After I declined, still a little bit mad, then the second I declined the third time and said, ‘I’m gay, I’m just not interested,’ that’s when it triggered him and he got very aggressive,” Cantrell said. 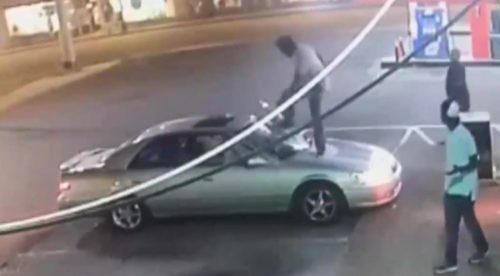 Security video shows the man jumped on her car’s hood and kicked in her windshield. She backed up to get him off, but he kept on attacking her vehicle. Cantrell panicked and got out of her car. She said that she couldn’t drive away because of the broken windshield, and she had pieces of glass in her eyes. “The only thing I was thinking while this was going on is he might have a weapon, he might have a knife, a gun, I don’t know. So pretty much just flailing every limb to get out of his grip,” she said. Now Cantrell says she’s moving out of her apartment and into her parents’ home. She doesn’t feel safe in her old place, which isn’t far from the gas station. Witnesses believe that the attacker is a man staying at a local rescue mission. Cantrell said that police couldn’t find the man there.